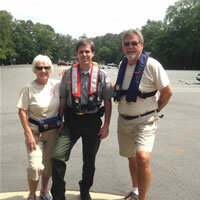 See the Allatoona Lake website for additional information. Primary recreational opportunities are listed below. Directions: From Atlanta, 45 miles north on I-75 to Exit 290, east on GA 20, south on GA 20 Spur to the dam and visitor center. Factoid: Allatoona Lake is one of the most frequently visited U.S. Army Corps of Engineers lakes in the nation. Located only 30 miles from Atlanta, more than 6 million visitors each year enjoy picnicking, camping, hunting, fishing, swimming and other water sports, and observing the abundant wildlife along the shores of this beautiful lake. The visitor center features video exhibits and displays about the area's history, ranging from the time of early Indians to the gold mining and iron making days, from Civil War up to the present.